The Looking Glass Knight is a plate-wearing, “specular monstrosity” that awaits challengers at the end of the King’s Passage. King Vendrick's lieutenant, charged with testing the prowess of those who seek to serve in Drangleic's order of royal knights. Ever dedicated to his duty, he continues to await challengers long after Vendrick's disappearance and the kingdom's subsequent collapse. Those who fail the test are remorselessly slaughtered by this enigmatic knight whose face lies hidden behind a cold metal mask. King Vendrick tried all manner of things to purge the curse that threatened his kingdom ,but when every last attempt failed the King fled through the King’s Passage and never returned. His warrior, the Looking Glass Knight, forever true to the King’s command, stands ready to expunge those who would challenge him. The Looking Glass Knight now serves to prevent any who would follow, from pursuing the runaway king, though now perhaps serves the purpose of guaranteeing a worthy heir to the throne. The Looking Glass Knight use the King’s Mirror as a shield. This item was likely created in Aldia’s Keep, as we find a number of similar mirrors on the walls. The Looking Glass Knight's true identity. We are not told the Looking Glass Knight's true identity, but perhaps there are clues. Some believe that the Looking Glass Knight is a golem created by Vendrick. This would explain why it could stand as a test to warriors, who were expected to defeat it in combat. If that was the case and the Knight was living, how could it continue to stand as a test after being defeated? 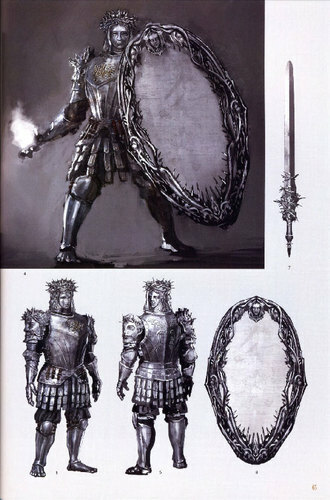 Another theory is that the Knight is a dark phantom from the dimension of the Looking Glass, summoned to this world by Vendrick and captured within the Looking Glass armor. 1. The Looking Glass Knight's armor and weaponry strongly ties it to (real world) Christian iconography. The helmet has a crown of thorns, three faces that each have different expressions (representing the holy trinity), the front face has tears rolling down the cheeks (an image associated with Jesus crying in Gethsemane and various saints), the body of the armor has wings on the back (associated with angels and cherubim) and the sword has thorns wrapped around its hilt. Jesus' life story is famous for many reasons, but he is perhaps most famous for his resurrection. Syan died first in an advance charge, displaying selfless martyrdom both commendable and pitiable. If resurrected (perhaps by Aldia) then he can be considered to have 'rose again'. 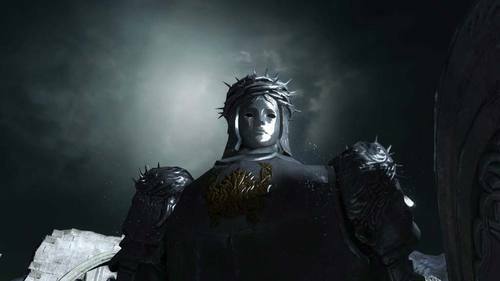 We know religious imagery of this sort does not exist in the 'soulsverse', but we can understand the visual motifs as players, and From Software may have been trying to convey this message to us through that imagery. 2. The King's Mirror is said to be a passage to another world. We can see the Through the Looking Glass reference here, but it may be that the intention behind it is that the Looking Glass allows passage for spirits from a different time, or different place (such as the afterlife). It may be that the Looking Glass is a connection between what we know as reality, and things that we cannot tangibly connect with. A contradiction to this is the fact that Players can be summoned through the Looking Glass, and they are definitely not dead (when they are summoned at least), but they are from a different time. 3. The known attributes of the Looking Glass Knight, while perhaps generic to a Knight of Vendrick, do match what we know of Syan. The Looking Glass Knight is forever true to the King's command. In other words, he is incredibly and deeply loyal. Loyalty was the primary attribute of Syan, along with his bravery. As well as this, the Looking Glass Knight is said to test the loyalty of potential warriors for the King. Who better to test loyalty to the King than one who is most loyal? 4. The Looking Glass Knight is at least to some degree human. He has a clear and deliberate breathing animation, and has animations for 'running out of stamina' situations. Known golems like the Ruin Sentinels do have incredibly slight breathing animations, though they lack the clearly human death cry that the Looking Glass Knight has. The Looking Glass Knight will also kneel down as if in prayer or supplication after being defeated. 5. The shrine at the beginning of the King's Passage could be interpreted as a funeral shrine. There are many candles burning, a known practice for honoring the dead, and a small bust of a knight with his sword planted in the ground. Interestingly the knight's sword creates a cross shape directly in front of the helmet front, which resembles the cross on the face of the Syan helmet. It would make sense, that if Sir Syan had become the Looking Glass Knight but the general populace only knew that he had been killed in the advance party, that Vendrick might set up this funeral arrangement in his honor. He may have set it up so close to the Looking Glass Knight's testing ground as a reminder that he had not truly lost his friend. As an aside, the cross also ties in with the other Christian iconography associated with the Looking Glass Knight. 6. The Looking Glass Knight and the Syan Knights (or Royal Soldiers) have a very similar lightning based attack. It would make sense that if Syan's soul was somehow linked to the accoutrements that King Vendrick commissioned (see below) then that knowledge might somehow pass on to the knights who put it on. There are a number of enemies who can utilize a similar blue lightning (Alonne Captains, Throne Watcher, Belfry Gargoyles), but none that seem to use it in such a similar way and with such a similar attack strategy. 7. The Looking Glass Knight is stationed in Drangleic Castle. We know that Sir Syan would have been of a high enough rank to be stationed there as well, and the Looking Glass Knight is theoretically stationed as close to Vendrick as you would've been able to be without being at his side. One must also pass through the castle treasury to reach the Looking Glass Knight, and only trusted warriors should have been allowed to go there. The story may run thus: Sir Syan led the advance party during the first invasion of Drangleic by the Giants. We can assume that there were multiple invasions, or that a single invasion and subsequent war lasted a long time because we know that Captain Drummond and his previous 2 generations spent their entire lives (though we don't know how brief those lives may have been) fighting the Giants. King Vendrick cared deeply for Syan, who had likely been with him since he first took the throne. His dishonorable death drove Vendrick to seek a means to resurrect Syan. So it was that Vendrick commissioned suits of armor based on Syan's accoutrements, but also infused them with some of the soul of his dead friend. This soul endured with its memories of Sir Syan, as the souls of Gwyn, Seathe, the Witch of Izalith and Nito have also done, though those were on a grander scale. When the promising knights therefore donned Sir Syan's replica armor, their minds became infected with the will of Sir Syan, who drove them thoroughly mad (with competing wills). So Vendrick turned to his brother, Lord Aldia for help. Lord Aldia at the time was experimenting with the Looking Glass and its ability to tap into other dimensions, or perhaps he decided to look into it at Vendrick's request. Whatever the case, with Aldia's help, Vendrick managed to draw Syan's phantom or spirit or essential essence out of the dimension it had been sent to upon his death, and encase it within the Looking Glass armor. Since he was not occupying a living mind, Syan was able to live on in his own right, but was never quite the same. Perhaps the Looking Glass Knight was considered a monstrosity by Vendrick (almost like a Frankenstein's monster, who was brought to life with lightning) who could not bring himself to admit that this was the same being as his old friend and therefore rejected him. There is definitely some evidence against this theory. Most notable of which is that descriptions of the Looking Glass Knight imply that he tested Vendrick's knights prior to Sir Syan's death. Though the timeline is difficult to pin down with certainty as the descriptions only say that long ago the King's Passage was a route taken by those wishing to prove themselves and that (in a different description) those who wish to serve the King as loyal warriors must face the Looking Glass Knight. The war against the Giants lasted a very long time and Sir Syan died right at the beginning. This test of facing the Looking Glass Knight could have been how Vendrick decided who would be worthy to lead his warriors in battle against them or become a new knight (to replace those who had died in battle), although admittedly, it does seem a little counter-productive to kill your own warriors. This way of testing warriors may also have been a later addition, as we know that the Dragonriders (King Vendrick's earliest warriors who helped him conquer Drangleic), were tested by trying to tame their mounts (the wyrms). who challenges visitors to the lordless castle. of the Looking Glass Knight. said to have been passage to another world. A greatsword forged from the soul of the Looking Glass Knight. Strong attack unleashes its latent power. Fearing something wicked, the King fled the castle and never returned. to expunge those who would challenge him. Worn by the Looking Glass Knight. Made of metal, but has high lightning defense. and face the Looking Glass Knight. by the merciless specular monstrosity.